Even before Donald Trump and Ben Carson roiled the GOP presidential race by surging past more traditional candidates in the polls, the nation’s Republicans were a restive bunch. Over several surveys, many expressed disapproval of their own party and leaders even after Republicans captured both houses of Congress in the 2014 midterm elections. One undercurrent in recent surveys – and a theme of the campaign itself – is the negative sentiment many hold for the political establishment. Seven of the 16 GOP presidential candidates are either sitting senators or have held office in Washington. But many of them are running as anti-Washington candidates, and others have battled party leaders, such as Texas Sen. Ted Cruz; he made headlines by taking on his own party’s leader on the Senate floor. 1An April 2014 poll found that extensive Washington experience was viewed more negatively than positively, more so among Republicans than Democrats. Republicans (36%) more than Democrats (20%) said they would be less likely to vote for a candidate with Washington experience. That figure rose to 56% for Republicans and Republican leaners who agreed with the Tea Party. Almost half of Republicans and Democrats said it wouldn’t matter to them if a candidate had been an elected official in Washington. 2A Washington Post/ABC News poll asked the question somewhat more pointedly and came up with starker results. About six-in-ten (58%) Republicans said they wanted the next president to be someone “outside the existing political establishment” compared with 24% of Democrats who said the same. About two-thirds (64%) of conservative Republicans said they wanted a candidate from outside the establishment. 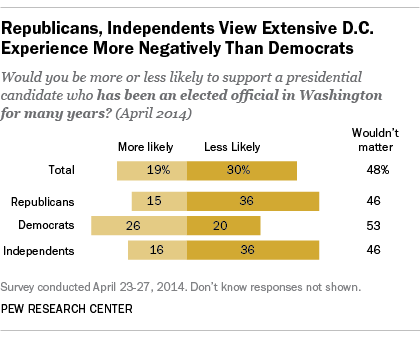 3Several recent surveys have tracked growing dissatisfaction within the Republican Party. Our July survey found that positive views of the GOP among Republicans had declined 18 percentage points since January, from 86% to 68%. By contrast, 86% of Democrats viewed their party favorably. 4 Republicans had much to celebrate after capturing both the House and Senate in the 2014 midterm elections, but their opinion of GOP congressional leaders soured during the first months of the new term. In May, Republicans’ approval of the performance of their leaders on the Hill fell to 41%, and just 37% said the leaders were keeping their campaign promises. 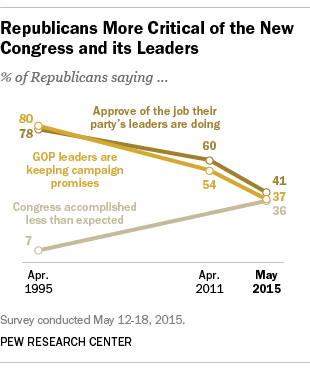 By contrast, in April 1995, after the GOP had recaptured both chambers of Congress for the first time in four decades, fully 80% of Republicans said that their leaders were keeping their promises. Three-quarters of Republicans surveyed in May said their representatives in Congress should challenge President Obama more. 5 Candidate Donald Trump has drawn attention to the issue of illegal immigration with his proposals to force Mexico to build a wall along the southern border and force deportations of those living in the U.S. illegally. But even before he made immigration an issue, about six-in-ten (59%) Republicans said in May that their party was not doing a good job representing their views on illegal immigration. This includes about two-thirds (65%) of Republicans who opposed legal status for undocumented immigrants. 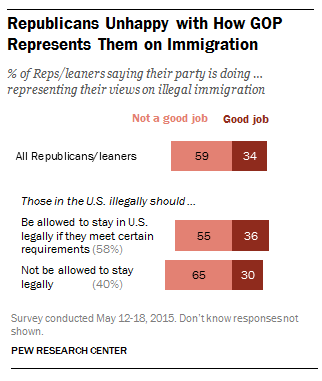 More than half (55%) who did favor a path to legal status also were unhappy with the party.